My first exposure to this fabulous video and song was in Crystal Lake, Saskatchewan, at the Adult Ukrainian Language Immersion Camp my sister and I attended a few years back. Presumably Mad Heads will be performing it at the Toronto Ukrainian Festival this coming weekend. If you can't make it to the festival to see Mad Heads perform live, or you just love hearing the song and watching the video, here you go. Here's a sneak peek of what Dunai may have in store for you this coming weekend at the Toronto Ukrainian Festival. They're playing a traditional Ukrainian folksong, Yikhaly Kozaky (Їхали Козаки), actually quite a gruesome and tragic tale played in a very upbeat polka style ... which is the norm for this song btw. Well, who said Ukrainians don't have a sense of humour? OK it can be somewhat twisted at times but, what they hey. If you can't laugh what's the point of being alive? For the Ukrainian-impaired, they give the plotline in English before they start playing. For those who didn't catch the program when it aired on Sunday, visit the Nash Holos website for the podcast! Meylakh Sheyket, of the Jewish Heritage Museum in Lviv, Ukraine, talks about he month of Elul on the Jewish calendar, and how it is observed by the Jewish community in Ukraine. Vasyl Pawlowsky presents another Kultural Capsule on the Montreal Ukrainian Festival which took place last weekend. I'll be posting a few videos of these acts that I particularly like. Here's one by Mad Heads. 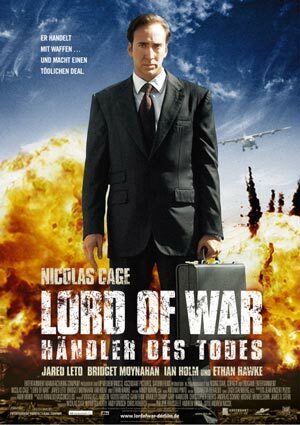 A few weeks back my DH and I watched Lord of War. If I'd had my way, we wouldn't have. But I'm glad we did. It starts out a bit slow, and being chronically short on patience, I was ready to ditch it after a few minutes. My DH insisted I give it a chance so, just to get along, I did. Good thing, too. What a powerful movie! Based (loosely) on real life characters, it's a real indictment of the arms trade. The acting is great. (It stars Nicholas Cage, after all!) And the story is gripping. So I found it a very memorable movie. Nonetheless, I had immediate doubts about the accuracy of the Ukrainian references. It's also doubtful that a senior officer in the Soviet army who, after the Soviet Union collapsed, would later have access to stockpiled arms, would have been a patriotic ethnic Ukrainian ... especially since, according to Wikipedia, the uncle’s character is based on a real-life person, Oleg Orlov, who died in a Kyiv prison in 2007 while under investigation for smuggling arms to Iran. I suppose these fictitious stretches make for a good story. But I dunno. I think it would have been a better story had it been closer to reality. Would you agree? In a real-life twist, shortly after I saw the movie, a friend who is an expert on Ukrainian politics and current affairs, sent an email saying that Viktor Bout was being extradited to the USA. As an arms supplier to terrorists including Al Qaida, he may be implicated in 9/11. There is some scuttlebutt that a deputy in Ukraine's Verkhovna Rada (parliament) ,Yuriy Bout, may be his brother. Yurij became a deputy after switching citizenship from Russian to Ukrainian and receiving his Ukrainian passport on the day before Gen. Yurij Kravchenko's two-bullets-to-the-head "suicide." There's not a lot of information about Yurij Bout that I could find, at least not in English. As for Viktor Bout, given his arrest there will likely be follow up stories in the mainstream media similar to this and this and this. In the meantime, despite the less-than-credible Ukrainian characterizations, I think it's still a movie worth watching (or watching again). If you've seen it, I'd love to get your take on it. If you haven't yet seen it, you can get the DVD at Amazon. Great article in the Kyiv Post about Ukraine's famous Sorochinsky Fair, which took place this year Aug. 17-22. Except for a period during the regressive and repressive soviet era, this historic open-air market has been around a long time. Ukrainian writer Nicolai Gogal (properly translitered as Hohol from Ukrainian) wrote a short story about it, and Mussorgsky composed an opera about it. With over 700,000 visitors, it is as popular today as it ever was. Villagers and gawkers from all over Ukraine flock to this annual five-day feast for theater plays and insane shopping. Back in the 19th century, this fair was no different from others. It owes its popularity to writer Nikolai Gogol, who was born in Velyki Sorochintsy, the same village where the fair is held. In his novel, he described all the action of wheeling and dealing, which, to be honest, hasn’t changed much. The fair is still a mess: rows of piglets mix with buckets of ostrich feathers. But for many, this eclectic mix of disorganized village produce is the main attraction. Presidents and parliament deputies make it a must stop to mingle with simple folk and buy Ukrainian souvenirs. The fair is only a three-hour drive from Ukraine's capital, Kyiv. Details of the fair (including highlights of previous years' fairs) are available at the fair's website here. Vasyl did a charming feature on the fair on his Kultural Capsule on the August 29 broadcast of Nash Holos. You can listen to it here. On last Sunday's radio program (international edition) I played Ukraine's 2007 and 2008 entries. The latter was a request from a new listener in Japan, and I thought it would be fun to play them back to back. Both years, Ukraine came second in the Eurovision contest. There was a very lively discussion on this blog back in 2008 about these artists and the direction Ukrainian music has been taking. You can check it out here, but in the meantime, here's the wild and crazy 2007 entry. On the August 22 show, Vasyl did a Kultural Capsule feature on Cheremshyna, a female vocal trio from Montreal. These gals have been on the Ukrainian Canadian music scene for several decades, and while they've slowed down a bit on the recording side of things, they're still making the rounds of local festivals and events. Cheremshyna became very well known in the days before the internet and social media, when networking was done face to face ... and maybe over the phone with a little help from the Ukrainian BBC, i.e., Баба Бабі Сказала (Granny told Granny). Of course musical excellence may have also played a contributing role in their popularity! In the 1980s and 90s they released several albums ... Volumes 1, 2 and 3 on vinyl (and cassette) and then on CD The Best of Cheremshyna and По Стежках Мрії (Along Paths of a Dream). They also released a wonderful Ukrainian Christmas album back in the 80s with a bunch of other local performers. It originally came out on vinyl and is currently available on CD at Yevshan, along with their "Best of" CD. Unfortunately, Cheremshyna doesn't have a website, but I did manage to find this YouTube video someone put together online. It's a slideshow with one of their recordings in the background...Ой там за лісочком (Oy tam za lisochkom) which means "there beyond the woods."